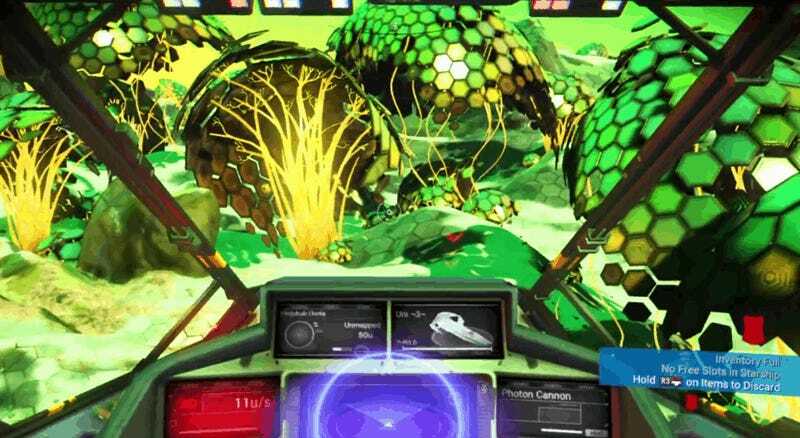 Atlas Rising, the latest No Man’s Sky patch, promised players “increased biome variety and rare exotic biomes.” Over the weekend, intrepid space adventurers have started to get a taste of what these strange new lands look like in action. Another player, TheCongzilla, recorded what fans are now calling a “bubble planet.” Unfortunately, bubbles do not seem to pop when the player walks through them. Kinda eerie, huh? Note, too, that the ground is full of dense metal orbs. Weird. Redditor dinkleberriez found a planet with these floating contraptions. Apparently, nothing happens if you try shooting them down. YouTuber LegitN00bM00ves stumbled upon a biome that I don’t even know how to describe. Is that some kind of crystal coral? Some of it kinda looks like giant jacks. And again, like all the other footage, you’ll note that the planet seems largely devoid of life. Given the immense number of planets in the game, it’s possible there are more rare biomes that nobody has discovered yet. And since this No Man’s Sky patch is gathering enough hype to launch the game back onto the Steam top sellers list, I’m sure it’s just a matter of time before we see more bewildering biomes.